Summer weather in the Netherlands is always unpredictable and unstable. June was very dry and sunny, we had a small heat wave at the beginning of July. The last few days felt more like Autumn, with lots of wind and rain! Most people complain about the rain, they prefer sunny days. And, of course, when school is finally out for summer, days should be warm and sunny so the kids can go swimming. You can imagine I prefer my four boys playing outside, instead of boring themselves indoors all day! I don’t mind a little rain, though, it’s good for the garden, it has been so dry! Because of the unpredictable weather, most people flee the country during summer and head south to warmer countries like France, Spain or Greece. And so will we. After this blog post, I will take a break from this blog and hope to see you again in August. We are driving to Italy. I am looking forward to spending time with my family, collecting wildflowers for my herbarium and photographing flower markets or flower stalls. It will be interesting to see what flowers are available and in season in Italy. I might even write a blog post about it, what do you think, next month’s Market days Italian style? If you like, you can participate in a contest by photographing flowers at your holiday destination. 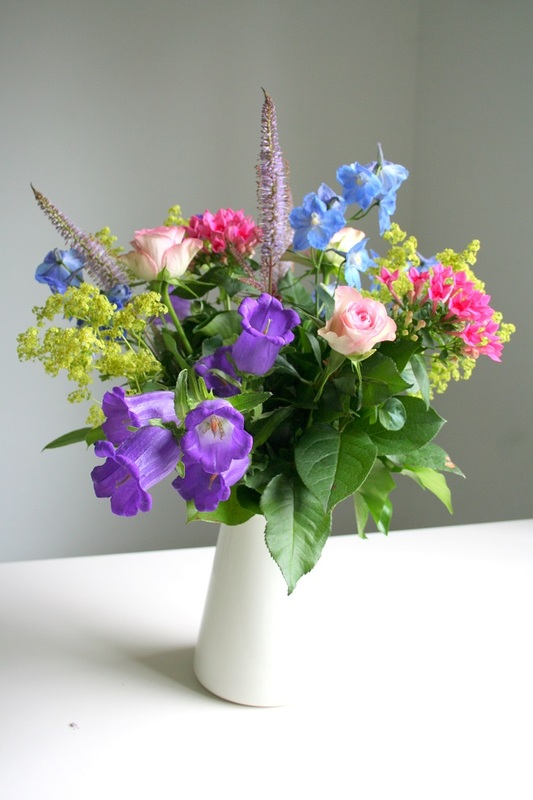 You can win a bouquet of fresh flowers delivered to your door every fortnight for six months. I will definitely send in a picture! 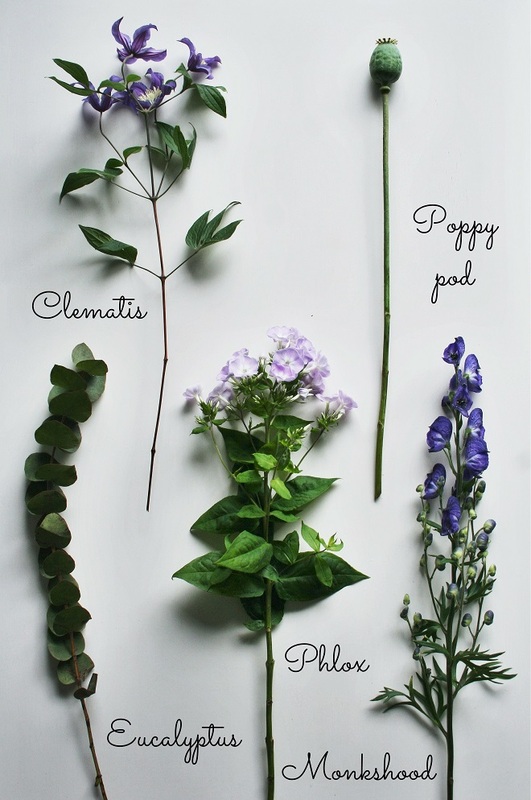 If you have been following this blog you must know by now that I am a flower lover. 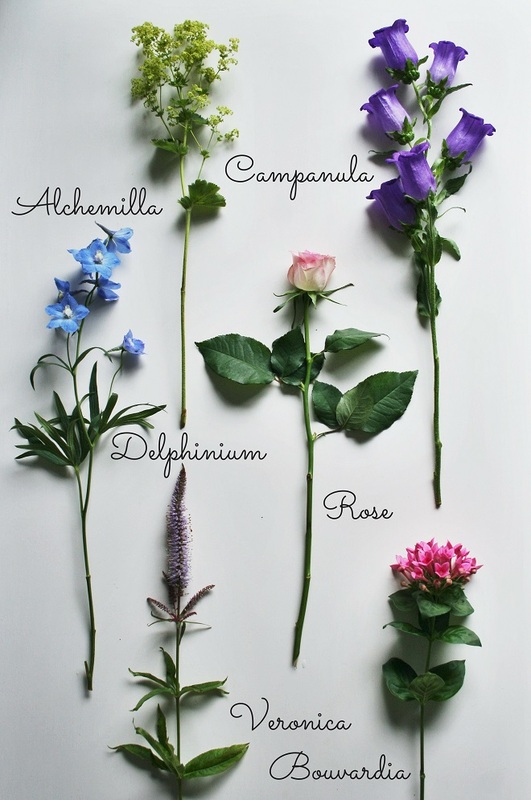 If you are reading this you must be a flower lover too! I try to always have flowers somewhere in my home and like to share them on Instagram using the hashtag #flowersonmykitchentable. If you’d like to join in, please do. I would love to see what flowers are on your kitchen table. I would love to see your kitchen too, but that’s just plain curiosity. 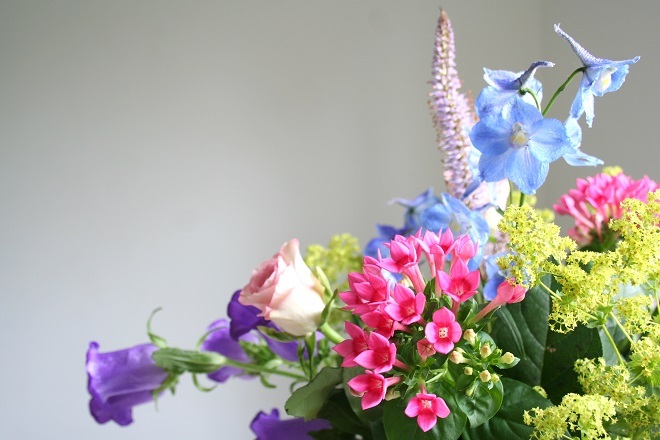 This week, I have two beautiful summer bouquets in my home. One is on the kitchen table, the other is on the dining table. I love them both and honestly can’t choose between them. Maybe you can? If you have a favourite, please let me know in the comments! 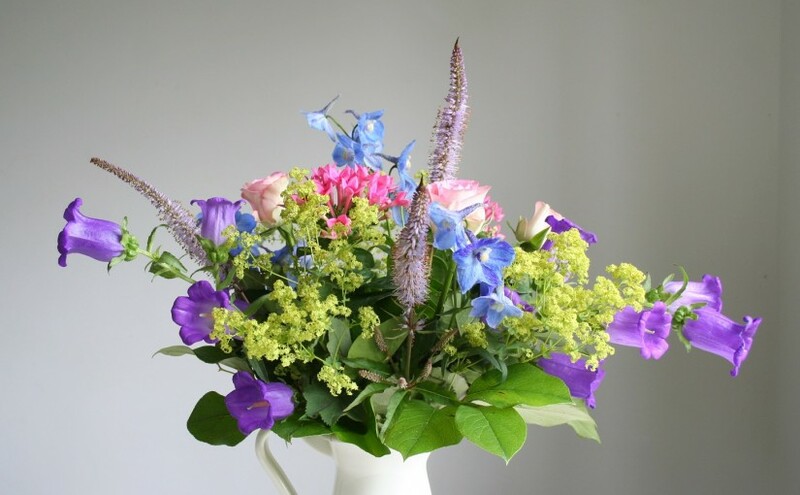 Add foliage around your bouquet to fill any gaps and support the bouquet in the vase. You can use ordinary ivy, which grows in most gardens. When buying flowers, I usually go for the pinks and purples. 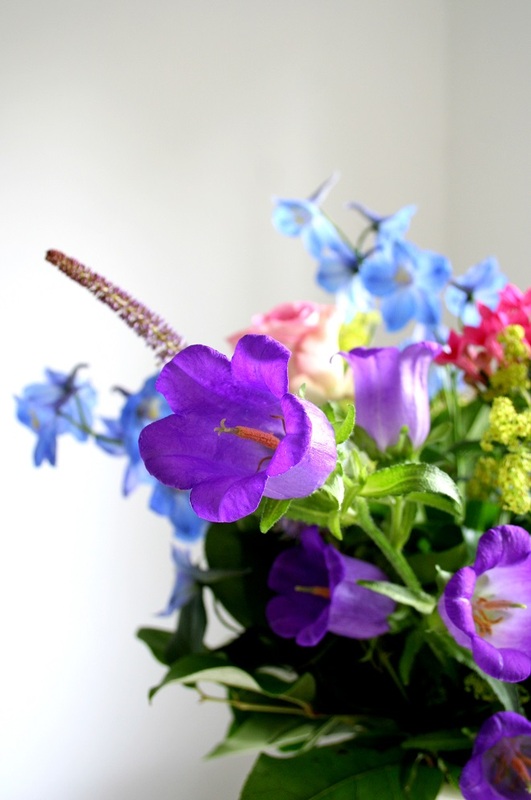 The campanula in this bouquet is just beautiful with it’s big, sturdy flowers. 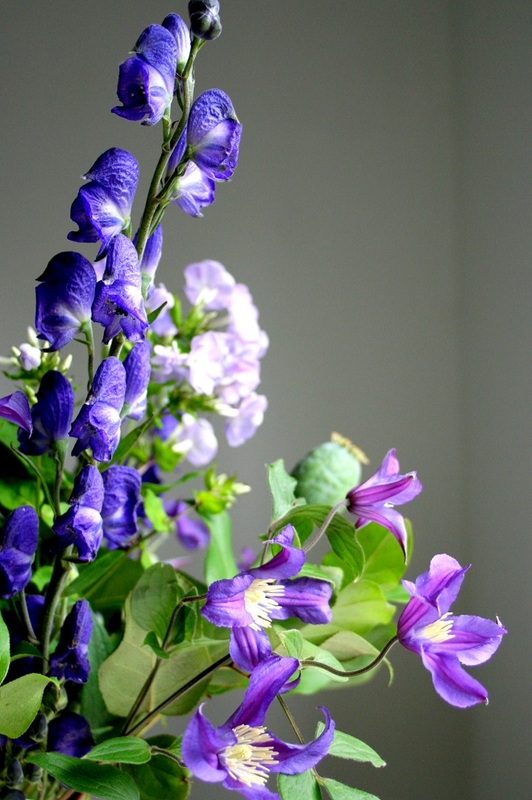 Campanula is also known as bellflower and comes in many varieties. I have several varieties in my garden, all with much smaller flowers. The soft pink of the roses gives the bouquet something sweet. Bouvardia is originally from Mexico but is grown in Holland in greenhouses. 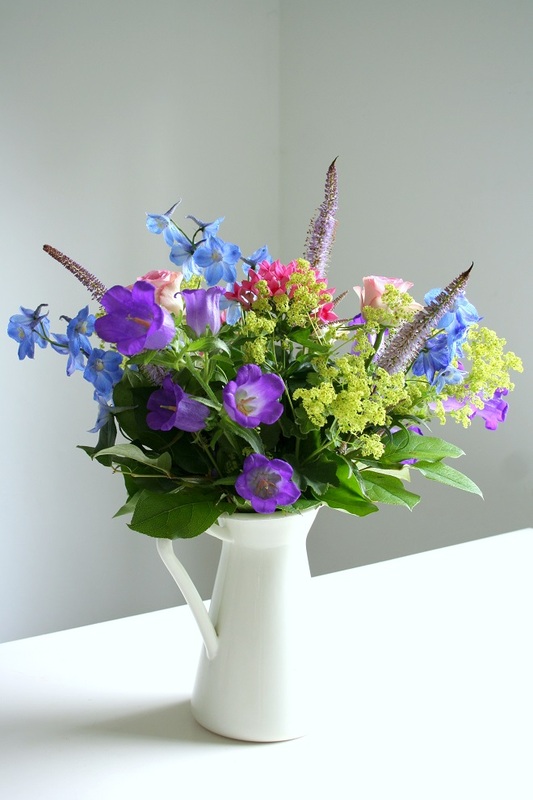 The delphiniums are a lovely addition, they are a beautiful transparent blue. 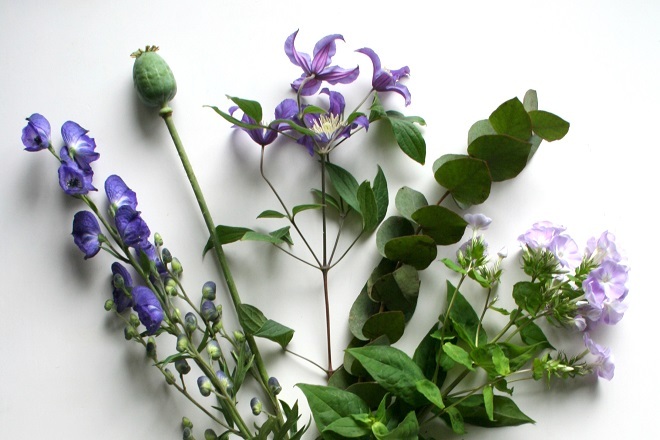 Mix foliage through the flowers to create a wilder look. These are actually all garden flowers, not from my garden, though. If you have been following this blog from the start, you know that my garden is still a work in progress. I have planted several new plants, but they are all being eaten by the slugs, even the plants that are said to be slug resistant like salvia. I’m beginning to think there is a reason why the old lady who lived here before mainly grew rhododendron and grasses. I do have phlox growing in my garden, it’s very pretty, but there are not enough stems to cut. 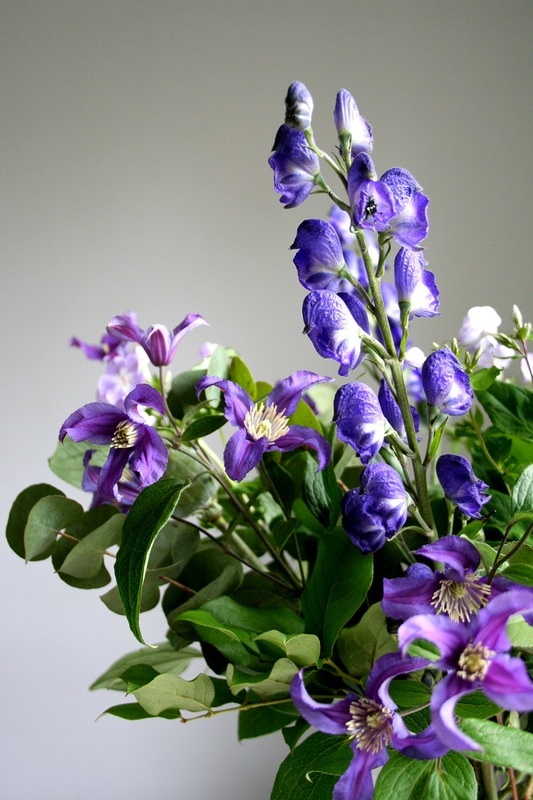 Clematis is known primarily as a climbing plant, but I think it looks beautiful in this bouquet. I want to plant one outside my kitchen window. 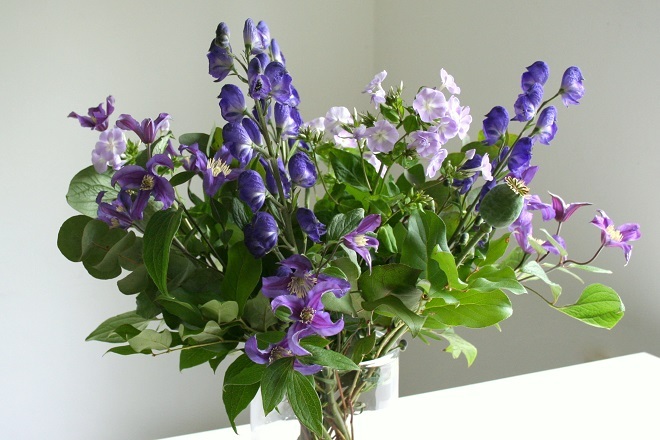 Monkshood is a very poisonous plant. 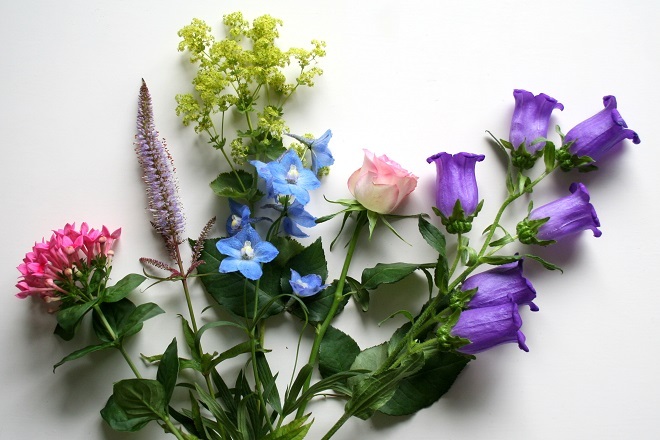 Having these summer bouquets in my home has taught me more about these flowers and given me new inspiration for my garden. I’m not giving up! I am taking a break from blogging and social media for three weeks. I’ll be back refreshed in August and look forward to seeing you then. My dahlias are starting to flower, so maybe then I can create another summer bouquet of dahlias. Have a good summer! mooi verhaal Pauline,geef niet op,eens gaat het je lukken om een pluktuin te hebben. Hoi Riny! Ik gee zeker niet op. Er is ook goed nieuws, de kogeldistel doet het goed, de vlinderstruik is in bloei en de persicaria ziet er mooi uit. Voor de pluk reken ik toch vooral op de dahlia’s. Je krijgt een bosje van me!